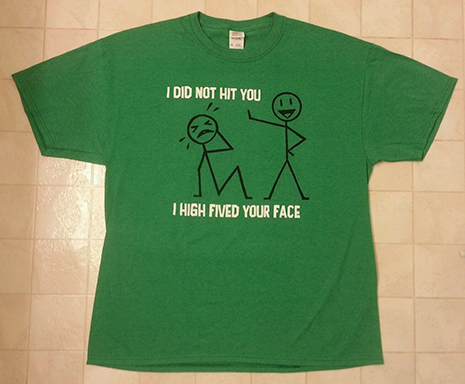 An Indiana man charged with punching his wife in the face during an argument over Valentine’s Day was wearing a t-shirt declaring, “I did not hit you, I high fived your face” when he was collared. Aaron Crowe, 30, was arrested early this morning on a misdemeanor domestic battery count after cops were dispatched to a Motel 6 in Evansville, where Crowe’s wife told officers that he pushed her and walloped her in the face. Crowe, whose wife had a bruise on her right cheek, told officers that the couple had been arguing about Valentine’s Day. Crowe was booked into the Vanderburgh County jail, where the adjacent mug shot was snapped. While the bottom half of Crowe’s t-shirt does not appear in the booking photo, the full garment can be seen below.